Nottingham has had an influx of new Thai restaurants with two opening in the last couple of weeks. Having visited Zaap we sent Mark to visit Thaikhun, which forms part of the new food development within the Intu Victoria Centre. 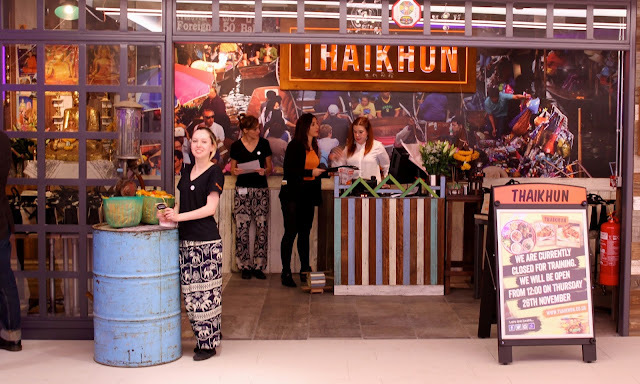 On Wednesday 25th November saw the VIP launch of a new Thai restaurant in Nottingham, The Thaikhun. Situated in the newly refurbished Victoria centre by the old clock tower with easy access to the restaurant from lift or escalator taking you practically to their front door! On arriving I am greeted by the staff and the organiser with a traditional Thai greeting. The decor is styled on eateries in Thailand even to the extent of importing everything that is used in the decorations. Due to this kind of detail the ambiance leads you to almost believe you are actually in Thailand on one of the streets famous for its street food-which is the aim of this restaurant. The restaurant has a wide range of seating on split-levels – I was advised by the host that this is unusual as they usually have a single level. However this floor plan creates little dining areas that if you want are much more intimate and private for that romantic date! If you want that sort of thing! Along with a lower area that can be a private dining area or hire for parties and is a bit more secluded. Down one side is the kitchen area, an island bar and lastly an out side area that will have great sun coverage in the summer- assuming we get any that is!. All in all it is a casual looking restaurant centred on the street food style of Thailand. Having received their “Monks Blessing” that day meaning they were set to open, So I was advised they don’t open properly until they have been blessed! Having a wander round the staff all greet you warmly and passing round drinks so when in a Thai restaurant its Thai beer, wine and cocktails on offer – and warm spicy smells coming from the kitchen promising great food later on. So on to the food and drink, my first taste was a lucky Buddha beer, in a rather attractive molded glass bottle with a Buddha on, this was a cold fresh and light beer, not to gassy as some other beers have a tendency to be and really refreshing. I have to say that I would have quite happily drunk this beer all night if it wasn’t or the other drinks to try! Next up a cocktail- not usually my sort of thing but I’m here to try out the food and drink so I go for a gamble. I’m told by the very helpful waitress, it has vodka, rum, pineapple coconut mint and basil, (I say helpful as she had to repeat the list several times!) interestingly served not in a glass but a takeaway carton! Oh and a whole chili! I guess this was the local touch and something a bit different. There was a definite tang to the drink and a sweetness from the pineapple – not usually my kind of drink but none the less acceptable and quite enjoyable. The last drink to try was the red wine on offer, who would have though that Thailand produced red wine! I didn’t so was pleased when I found out they did! From the Hua Hen Valley this is a nice fruity wine made with the pomdok grape – this is a nice easy drinking wine and would make a nice accompaniment to any meal. It’s not on the scale of more established producers but all the same it was a good wine and positively drinkable. Now on to the food, as this was The VIP opening night the main menu was not available, the kitchen were producing several samples of the menu for us to try, I have to say that I really enjoyed everything I tried – I just wish there had been more of it!! But then as a foodie I like food and I especially like eating it! But do not despair! I will be returning to have a real sample of the menu and some of the fish dishes and a full write up focused more on the food and the menu will be forth coming! So for now let me tantalise your taste buds the way mine were with the prawn crackers. So we all think we know one prawn cracker is much like another, pale tasteless and way to crumbly!! But not so these, they were crisp a speckled pale toasty kind color and they tasted of prawn with subtle chilli undertones that gradually built the more you ate (I had 2-3 baskets!! Personally I think it would have been rude to refuse such a delicious taster!) they were unlike every prawn cracker I have ever had – I think the local Chinese takeaways need to up their game on their prawn crackers as these were very nice and oh so Moorish! Next up was the Moo dad deow- or sweet fried pork! Like most of the samples this was served in a basket and brought round to the tables by the waiting staff on trays full of the different samples, the pork looked like it was prepared in a dry rub but was actually honey and sesame seeds no sauce so a dry dish in that respect, but the meat was so tender and moist full of spicy sweetness I would of happily polished off 10 times the amount, but this is listed as a starter on the menu is meant to get the gastric juices ready for the main course. Did I mention that they were very Moorish as well? Along with the Moo dad deow came the Por Pia Gar! That’s chicken spring rolls with sweet chili sauce, these were light crispy and very tasty and went great with the chili sauce- which incidentally was pretty good with the pork as well as I discovered later. The vegetarian option was sweet corn balls, again served with the chili sauce, golden balls of rice and sweet corn not amazing in and of themselves but pretty nice with the chili. Lastly we have the Khao moo deng moo krob! Or BBQ pork on rice, this was the only main course on offer and hopefully portion size wise was only a taster as I could have happily eaten 5-6 bowls of the size served. Having said that it was a tasty dish the rice was served sticky with the pork on top again the meat was sweet tender and a slightly more honey taste to the American style BBQ sauce we see in just about every pub and restaurant these days. Over all this was a good taster of what is to come the restaurant has a great ambiance to it with friendly staff, I spoke to several members of the management and all were more than willing to chat and offer insights to the restaurant. The one thing I would have liked to see more of is the vegetarian choice, this was extremely limited, this was not a problem for me but my friend who is vegetarian it is a problem. Largely this was due to only a few sample dishes being on offer – I would have been tempted to have a buffet with the most popular dishes and a greater choice of vegetarian food and encourage guests to try something different rather than going for possibly what is the “safe” choice I would have gone for the dishes which are more unique to Thailand and emphasised the diversity of Thai cooking. Staff then could have explained the dishes and have guests try what is one of the great country cuisines in the world with so many diverse flavors it is a shame more of this was not on offer. The return trip for me is highly anticipated and I look forward to trying some of the fish dishes and going for something a little different to what I normally eat, all the food I tasted was very tasty and displays a small part of what is possible from this latest venture from Thaikhun. So I will leave it there for now but stay tuned, as I will be there again for a greater taste of the menu and a greater disclosure of the dishes we try. I will be with 2 friends and together we will bring our unique views to the table and bring you a write up with more delights to tantalise your taste buds.